Welcome to the “Love Bugs Banners for Kids” Hop. Forty very talented crafty people have come together for a two day hop (Friday, January 6th and Saturday, January 7th) to showcase handmade banners that will be donated to the children at Pediatric Specialty Care. The hope of these banners is that they bring smiles to these children's faces and awareness of Pediatric Specialty Care to all those that hop along. 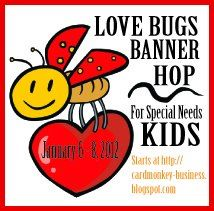 The “Love Bugs Banner for Kids” Hop has some awesome sponsors and prizes to give away to all those that hop along and leave comments. The more blogs you visit and leave comments at, the more chances you have of winning. That means if you hop through all 20 blogs each day and leave a comment on each blog then you are in the drawing 40 times! Jellypark Digital Stamps will award 2 free digi-images to one winner. K Andrews Designs has donated a stamp set to one winner. Robyn's Fetish will donate FIVE digital images of the winner's choice as a prize! Now on with the hop....If you have come from Jearise's then you are on the right track but if you have come here by chance – great! but please start from the beginning at Ellen's and continue through from there. For my "Love Bugs Banner" I chose to use a ladybug theme and the word Hugs. I really love how it turned out I only wish I had better pictures to share. I used the imagine to cute the hearts It ha the shapes as part of its software. I believe they were cut at 4.5 inches for the red and 4.2 inches for the white with black dots. The red card stock is Recollections from last years valentine pack. The white doted I printed on white card stock from a free file from Gina K Designs Stamp TV. Love her tutorials. The Ladybug is from a free file from Digi My World . She has some really great designs both free and for sale. The lady bug was printed on white card stock so it measured 2 inches for the larger ones and 1 inches for the smaller. The letters were cut at 2.5 inches from Ashlyn's Alphabet and the shadow in black. Thank you for joining us today on our “Love Bug Banner for Kids” Hop for the children of Pediatric Specialty Care. Please continue on to Denise's blog and have a wonderful day. OMG, I adore these rosettes and the sweet HUGS your bugs are delivering. THANK YOU for participating in this very special hop. Blessings to you for your kindness!! Beautiful job on your banner. It's just darling. I love the rosettes on your banner. It is super cute. The kids will love it! I love everything about your banners its beautiful, your design is fab love it. Your banner is so pretty and girly! Love it! Thanks also for all those links! TFS! Adorable - love those paper rosettes - gorgeous banner. Hugs, everyone need these. The lady bug is so sweet. Great banner! I LOVE LOVE LOVE your banner! All the colors and textures and adorable cuts are so perfect!! Janet, no apologies necessary!! Your banner is wonderful. Love all the embossing and rosettes. I adore those cute little lady bugs, too!!! beautiful banner. you did an amazing job with the hearts and lady bugs (with super cute faces). AWESOME banner! I love all the layers. Great embossing. Great papers. Super cute banner! Love the papers and colors you used! Love this banner it is adorable. I love all the detail especially the embossing and the wording is so cute and it is so fresh and bright. This will put a smile on the childrens faces. Adorable with all the polka dots and detail. This banner is just the cutest, my favorite are ladybugs! Very cute banner, I love the ladybugs. Nice colors. You packed a lot of texture in your banner ~ the embossing, the rosettes, the pop dots ~ adorable!!! Love the lady bugs too! Love your banner. The embossing and rosettes add so much. Love your banner and the embossing on it and the instructions for how you did it. Thanks so much. the banner is absolutely adorable...but the reason behind the making of it (the cause for the kids) is even MORE precious....its a wonderful thing you are doing! Thanks for stopping by and finding our freebie ladybug, glad it was put to such GOOD use! !